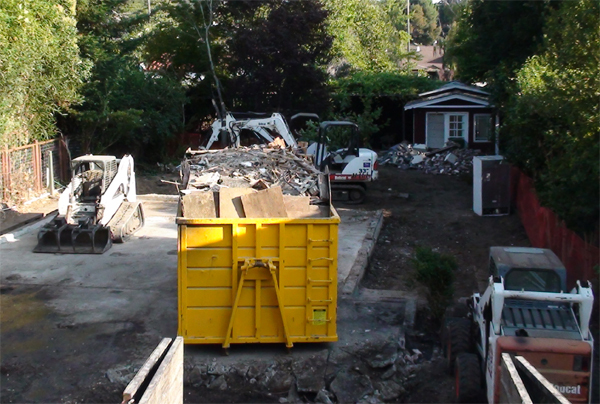 If you're taking on a large demolition or cleaning job, you may want to consider hiring a dumpster service to help contain and dispose of all that trash. A typical rental service will provide "roll-away dumpster," a large metal container on wheels with an open top to put your trash. The rental company will deliver the container to your property, and you can instruct the driver to drop off the dumpster at a specific location. You can then begin filling the container with your trash up to the maximum load limit. Once you're finished, simply call up your rental company and arrange for a pick up. The service will then take the trash and dispose of it in a materials recovery facility or landfill. Dumpsters come in a multitude of sizes, depending on the company you select. Most come in 15 yards, 20 yards, 30 yards and 40 yards. Selecting the correct dumpster size for your job will save you money and time. Selecting a too-large dumpster will cost extra money, while selecting a dumpster that is too small will require you to schedule additional hauls and delivery. Keep in mind that each cubic yard holds about 15 kitchen-sized trash bags or 6 large trash bags. If you're unsure about the right size of dumpster you'll need, many dumpster companies will help you decide based on the specifics of your job. Some companies also offer green options. While many companies will provide a separate container for recyclable trash, many offer to sort out your trash into recyclables and donation items for you. This service may be offered at an additional cost or bundled into your quote. Most municipalities do not require a permit, but you'll need to check with your town or city about their particular regulations. Additionally, dumpsters can become very heavy once full and may cause damage to your driveway, pavement or lawn. Ultimately, you are responsible for any damage the dumpster causes to your property, not the dumpster service. In order to prevent damage, place a large piece of plywood under the wheels of the dumpster to help distribute the weight. You'll also need to take note of the items you place into the dumpster. You cannot dispose of any hazardous waste, chemical products, pesticides or radioactive material. Any flammable materials are also prohibited, such as aerosol cans, propane tanks or motor oil. Check with your service for more specifics about what you can and cannot place into the dumpster. With most rental services, you pay for the delivery of the container, the weight of the trash and the haul. The cost varies depending on location, length of rental and size of the container rented. Local costs, such as landfill costs and dumping taxes by the municipality, also affect the price. Decide what you need. What kind of job do you need the trash container for? How much trash will you have? Determine your needs first and then start looking for a suitable company. Do you research. You can also search the member reviews on Zbynet Network to find a reliable dumpster service in your area that won't change you an arm and a leg for services you won't need. Disposal. Find out how the trash will be disposed. Will it go in a landfill? Will it be taken to the appropriate recycling facility?